Dakota Prep is a water-based and biodegradable cleaner that will remove wax buildup, grease, oxidation and grime from a variety of surfaces. Dakota Prep must be used to prepare surfaces before the application of Dakota Shine. Dakota Prep can also be used to prepare surfaces for paint or wax. Dakota Prep is a concentrated product, so it must be mixed with water before using. It is partially derived of agricultural by-products, therefore making it environmentally-safe. 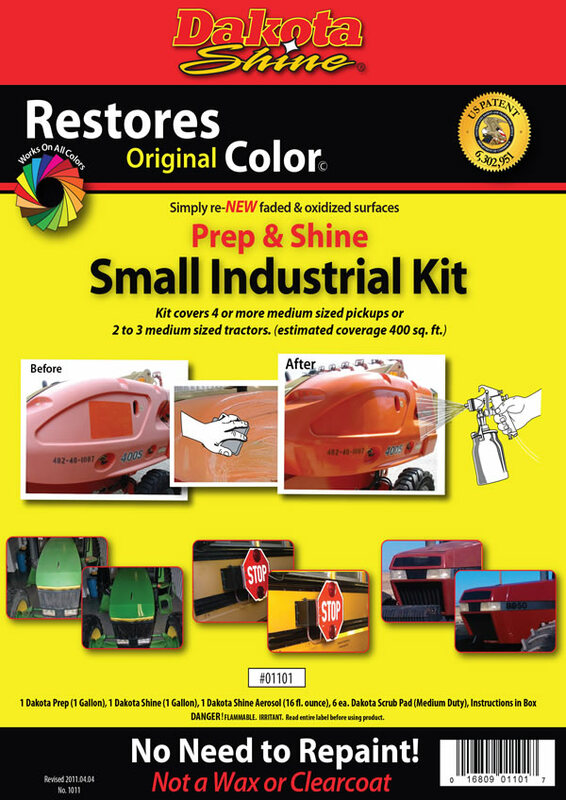 Dakota Prep is a safe and easy-to-use surface prep product. 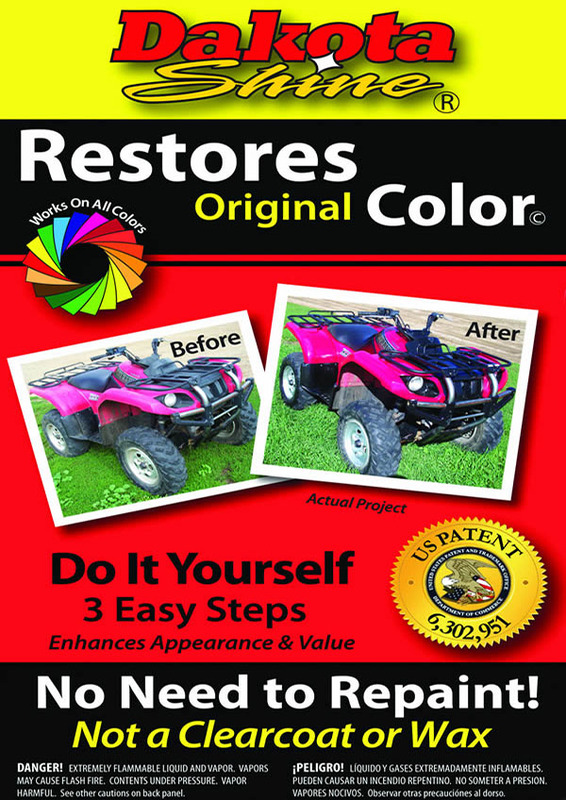 Dakota Shine is a unique and patented product that will restore the color, lustre and value to faded and oxidized surfaces like paint, decals, plastics and more. 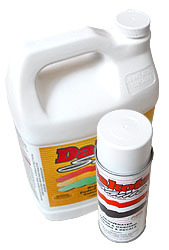 Dakota Shine is a ready-to-use product that requires no mixing. There is no product to waste or dispose of, simply pour any leftover product back into the container. Dakota Shine consists of agricultural by-products and various other proprietary ingredients; it contains no silicones. Dakota Shine may turn some white paint a shade of off-white. These ingredients are designed to penetrate the surface to rejuvenate the pigments to their original, like-new appearance. 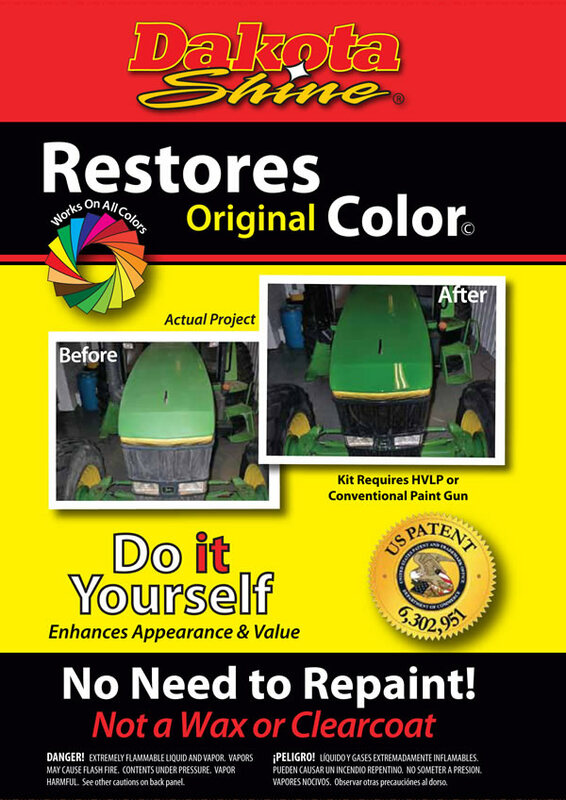 Dakota Shine is a very cost-effective substitute to repainting oxidized surfaces, replacing faded decals or wet-sanding & waxing. Dakota Prep is available in a concentrated form in 1 gallon jugs, and 15 & 55-gallon drums. Some customized packaging is available. Dakota Shine is available in 12 oz. aerosol cans, 1 gallon jugs, and 15-gallon drums. For large projects, customized packaging is available. Dakota Shine has 5 different sizes depending on your application. Simply select below which product works for you! Coverage Approx 100 sq. ft.
Coverage Approx 400 sq. ft.
Coverage Approx 800 sq. ft.
Coverage Approx 1600 sq. ft.